Surrounded by greenery, right at the very edge of the town, Marebosco Bed & Breakfast offers its customers both proximity to the sea as well as extraordinary peace.Overlooking the bay, our location offers a coolretreat, whichcan be enjoyed thanks to our green areas, away from the city. Located on a small hill, the property has a wonderful sea view that is visible between the trees of the grove opposite. Our B&B is an ideal setting for those who want to enjoy a peaceful stay in contact with nature while enjoying the convenience of being just a few minutes drive from the beautiful beaches of San Leone and the world renowned Scala dei Turchi. Our rooms, all doubles and very spacious, are also available for single use. Breakfast is served, depending on the season, with the option of eating outdoors in the shade on the terrace. air conditioning, and free use of the garden spaces. Worthy of particular mention is definitely the breakfast, the most important moment for us and for our guests. At breakfast we serve wholesome, home-cooked foods such as fresh croissants, durum wheat or sourdough toast with butter and various jams, home-brewed coffee with milk or tea of various aromas of various, juices of different flavors, tarts or specialties, and much more depending on the season. 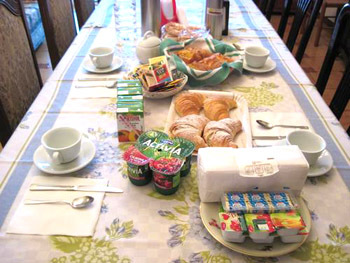 Breakfast is often a great time to talk with the other guests of the B&B and the staff themselves, to exchange information about the places and routes to follow throughout one’s stay in the countryside, inValle dei Templi, Agrigento, Favara, from San Leone to Aragona, and beyond. -Cafes, Bars, Bakeries, Restaurants; Taverns; Pizzerias; Diners. -Car Auto motors and inflatable boats. -Sport fishing vessels and visitsalong the Empedoclina coast, equipped with fishing equipment. -Guides for hiking around the Empedoclino territory and the hinterland of Agrigentino with detailed explanations of manners and customs of past societies. -Wind & Kite Surfing Clubswith courses offered for a total of 6-8 lessons, which can be taken together or separately, i.e. every weekend. All this and much more, in the wonderful town of Porto Empedocle, land of famous writers, such as Luigi Pirandello and Andrea Camilleri, whose novels echo the evocative places now brought to life in the popular Montalbano series. Call or write now forfurther information, to inquire about the current availability of rooms and the best deals awaiting you in our facility.